One of the things that you need most before or after an action-packed day at Dollywood is a comfortable night of rest. So, you will be happy to know that we have cabins of all sizes to meet your needs! Whether you are seeking a 4-bedroom cabin for a large family or a group of friends or an 18-bedroom cabin for a family reunion or church retreat, we have you covered! Everyone in your group will love having the privacy of their own bedroom and will feel fully rested and ready to visit the theme park in the morning! Your group will be pleasantly surprised to know that our rental cabins near Dollywood are much more affordable than a hotel! When you compare the cost of staying in separate hotel rooms versus one of our large cabins with multiple bedrooms, we come out ahead every time! In fact, you can use our convenient money saving calculator to see how much you save just by staying with Large Cabin Rentals! The fun doesn’t stop when you leave Dollywood because there are tons of entertaining amenities available in your cabin! 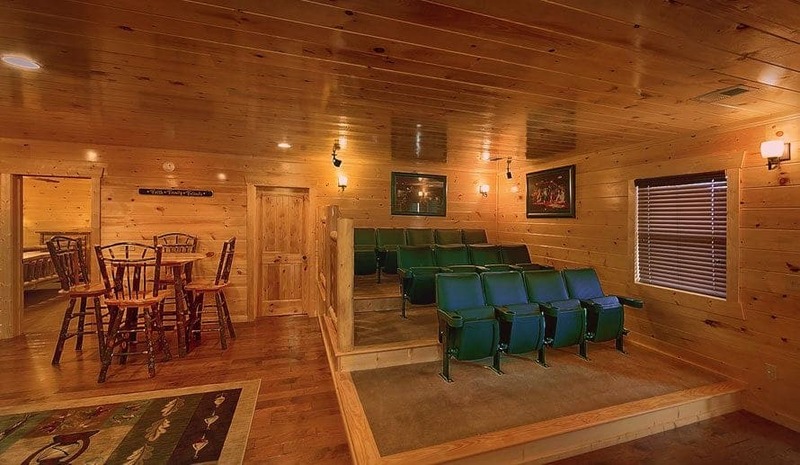 Many of our cabins feature a home theater room where you can enjoy a massive movie screen and state-of-the-art sound system for the ultimate viewing experience! The only thing that you need to bring along is the popcorn, which you can easily make in your cabin’s fully equipped kitchen! If that doesn’t sound good enough, we even have some cabins that include a private indoor swimming pool! From game rooms to hot tubs, there’s something for everyone in your group to enjoy. While Dollywood is home to exciting roller coasters and world-class shows, the park also has some of the best restaurants in Pigeon Forge! If you experienced one of the delicious buffets or enjoyed some ice cream or cotton candy during your visit, you can take advantage of our modern exercise facility to work off those extra calories! The newly renovated fitness center at Large Cabin Rentals features a treadmill, free weights, several weight machines and a flat screen television for some entertainment during your workout. The fitness center also features a sauna and steam room facility, which is a wonderful way to unwind after a day at Dollywood! Check out all of our Smoky Mountain cabin rentals near Dollywood today to enjoy the best group accommodations in town! We look forward to seeing you soon at Large Cabin Rentals!